Fully establishing itself in the early 1990's. TITAN a major independent manufacturer of fishing products and the first fishing company to design and manufacturer clothing, luggage and accessories exclusively for the Sea Angler. Our extensive ranges of award winning innovative products are made from using only the best raw materials available. Over the last 3 decades the TITAN brands have become synonymous with top quality affordable products for anglers, and it is not uncommon for anglers to use the word "TITAN" as a pseudonym for waterproof clothing, dating back to circa 1993 with the launch of the very first TITAN ¾ length Waterproof Breathable Smock, quickly followed with the TITAN Waterproof Breathable Salopettes manufactured in the northeast of England using British EXEAT® fabric conforming to BS EN 343. The TITAN range has been ergonomically designed and constantly improved by experts with over 50 years experience in the textile business, with input along the way from top international anglers and the many thousands of Sea Anglers and Titan fanatics worldwide. We fervently believe in the sport of sea angling, and are dedicated to continue to manufacture the highest quality range of products, for example our Storm waterproof breathable clothing, made exclusively from our own TITANTEX® fabric launched in 1996 was appraised the best garment out of nine other brands tested by SEA ANGLER magazine, we believe this is because all our products are sensibly priced, rigorously tested and painstakingly designed to equal the dedication and devotion that the angler brings to the sport of fishing. Following on from our success we expanded into the Country pursuits, Carp and Coarse fishing world receiving excellent reviews in COARSE FISHERMAN, LETS GO COARSE FISHING, SALMON & TROUT and other leading magazines. Our clothing has also been presented with the ANGLERS MAIL BEST BUY award. In 2009 the ethos continued with the release of the radically innovative TITAN ™ RETRO RANGE. 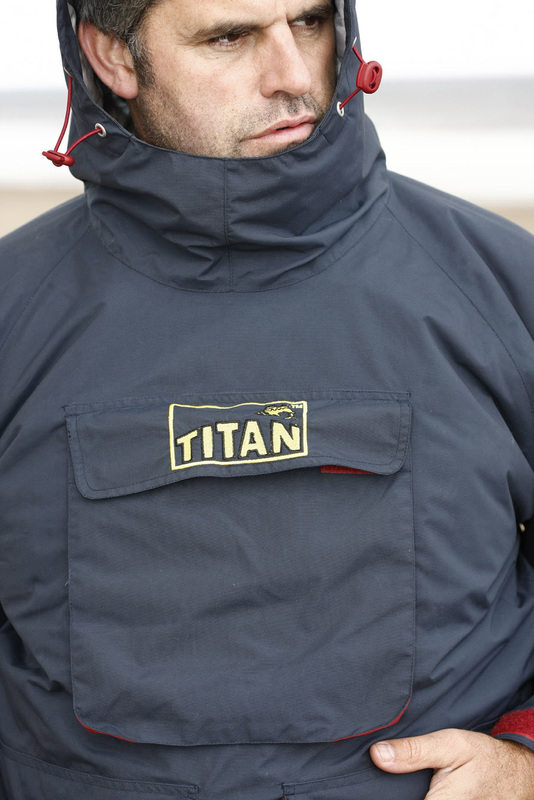 The ALL-NEW TITAN ™ RETRO BREATHABLE WATERPROOF SMOCK manufactured with ENTRANT® fabric made in Japan. Manufactured with ENTRANT® made in Japan. 2017 saw the launch of the ALL-NEW TITAN ™ ORIGINAL COTTON HOODIE SMOCK made to our specifications is quite simply the BEST cotton fishing smock we have ever produced or seen fusing Titan tradition, style and originality with a modern twist for the 21st century angler. "Beware of cheap imitations". The smock was improved upon once again in 2018 now tailored with heavyweight 100% pure cotton conforming to BS EN 533 1997, BS EN 531 1995. 2018 Titan relaunched the ALL NEW TITAN MATCHMAN ™ range with The first ever clothing addition. The New 2018 Titan Matchman ™ Limited Edition Fishing Hoodie Smock & Action Trouser Suit was SEA ANGLER Magazine's Pick of the Month issue 553. 2018 also saw the return of the much loved TITAN 40 litre Rucksack and 8 foot long Rod Carrier now re branded as TITAN MATCHMAN ™ Original Rucksack and TITAN MATCHMAN ™ XL (Extra Long) Rod Carrier. The ALL NEW TITAN MATCHMAN ™ range sees Titan fusing tradition, style, functionality and originality with modern fabrics fit for the 21st century angler. TITAN were also the first 'non-rod and reel' fishing tackle company to win the highly coveted NATIONAL ANGLING AWARD for waterproof breathable clothing and luggage. Since 1997, we have accumulated an unprecedented 14 of these prestigious accolades for our products and service. What makes our achievements even more special is that all of our awards were won through the votes of the readers of SEA ANGLER magazine (the angler) and not the industry. TITAN, is the only fishing product company that solely manufacturers clothing and luggage. So with our many years of expertise in this field, TITAN is in a unique position to fully comprehend the clothing and luggage requirements of the angler, head and shoulders above any other company. TITAN ™, TITAN.FISHING, TITAN MATCHMAN ™ and TITANTEX® words and logos are trademarks of Titan Fishing Products Ltd.